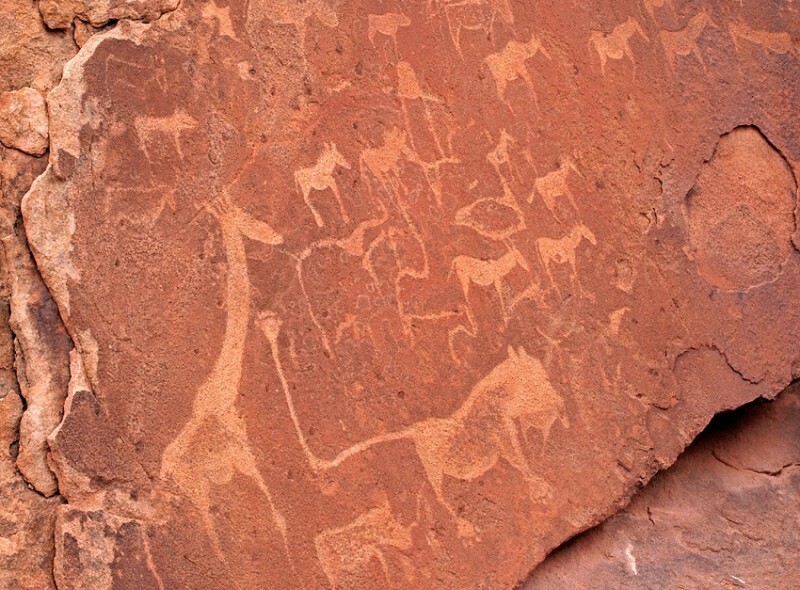 Twyfelfontein has been Namibia’s first and only World Heritage Site since 2007. It is known as “Twyfelfontain” but also has a Nama/Damara name – “ǀUi-ǁAis” (jumping waterhole). 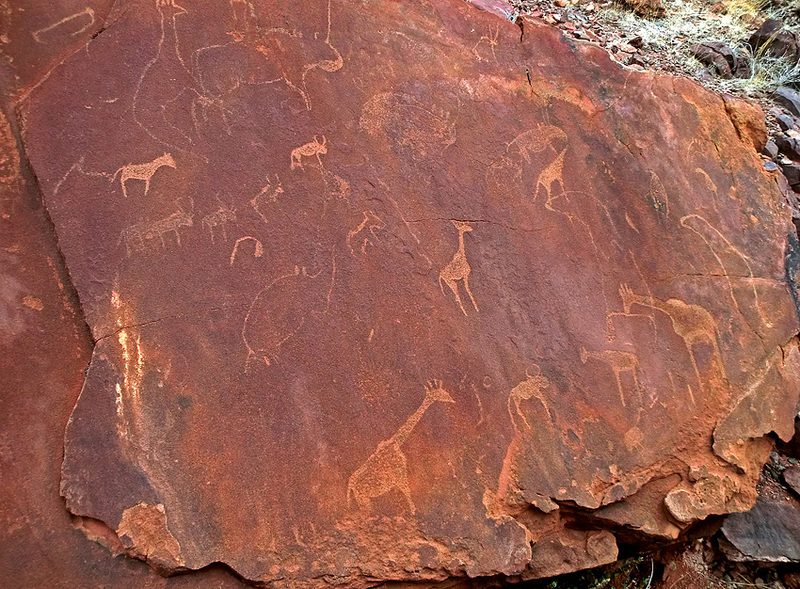 No other engraving site of Africa has the extent of Twyfelfontein. 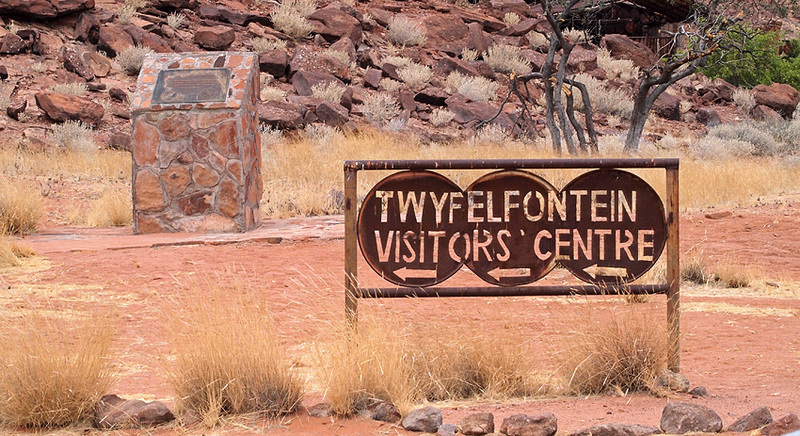 The area around Twyfelfontein is an area between the semi desert and the savannah. The yearly rainfall is less than 150 mm. Let’s start with the name. A German Jew named David Levin came here in 1946. Because of drought he was looking for a new place to settle. He travelled with a donkey cart and followed an elephant track. 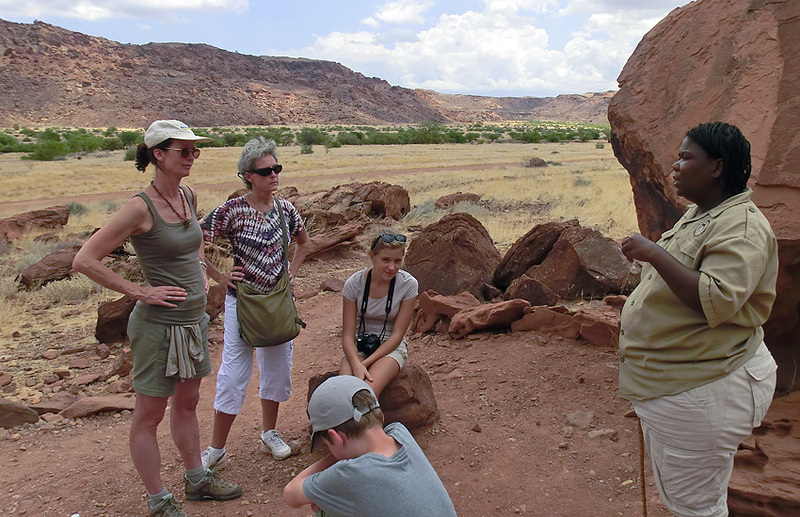 His family met a group of Damara people living next to a spring. Levin found the place beautiful and decided to stay. The site has been inhabited for at least 6,000 years, first by hunter-gatherers of the “Wilton stone age culture group”. They made most of the engravings and probably all the paintings. 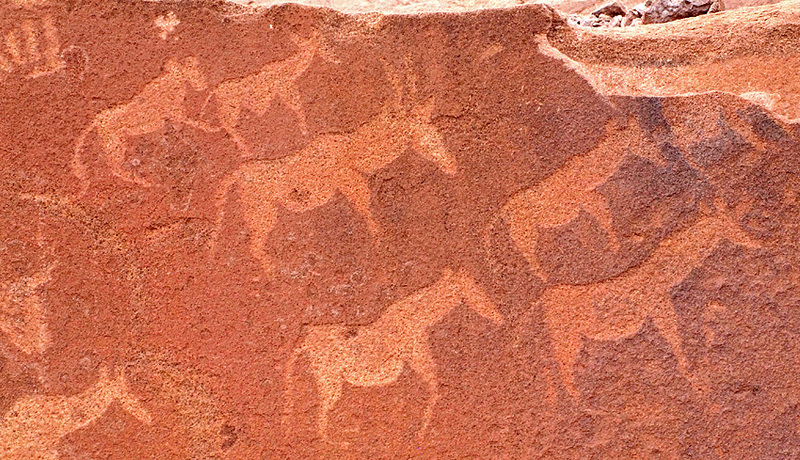 There are carvings of different animals like rhinoceroses, elephants, ostriches and giraffes. 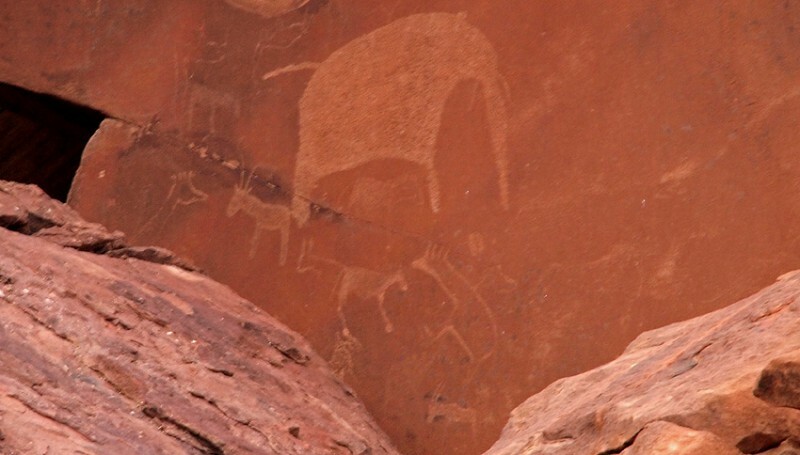 At first the theory was that people simply made pictures of what they saw around them and of the game they hunted. 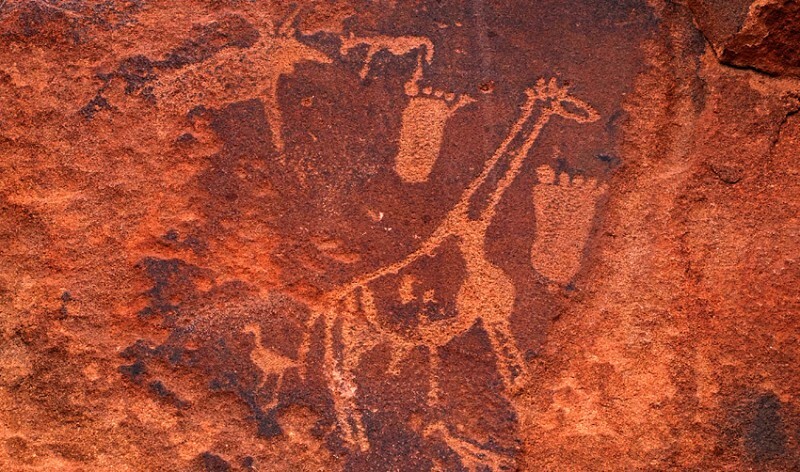 Some of the engravings are today thought to depict the transformation of humans into animals. They are thought to be made as part of shamanist rituals. The most famous being the “Lion Man”. 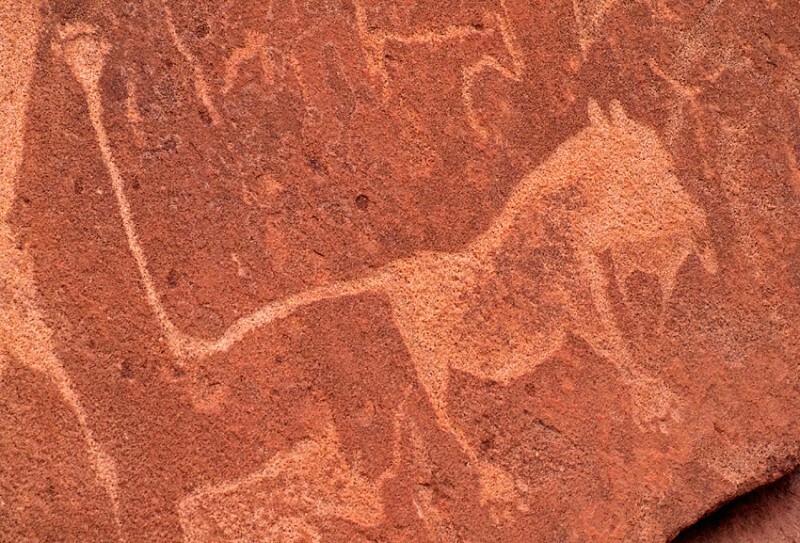 It is a lion but it has a very tall tail that ends with a “six-toed pugmark”. 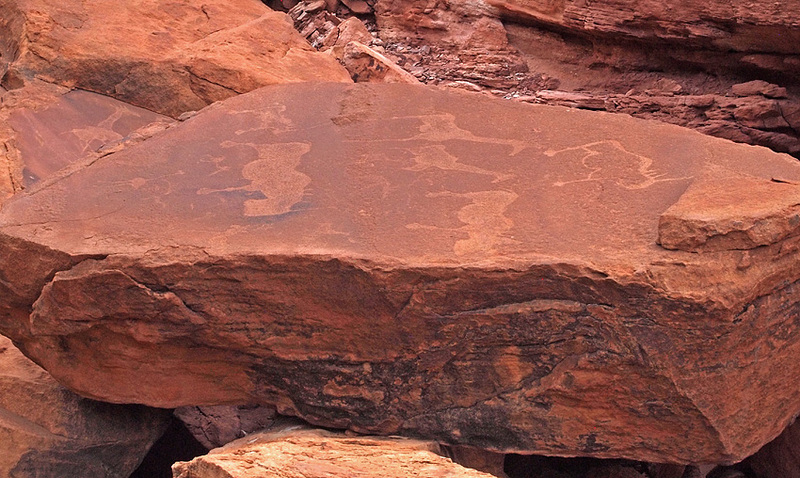 Later on, from 2000 ar even 2500 years ago, more engravings were made by the Khoi-khoi (San) people. They also looked on this place as a place of worship where they performed shamanist rituals. 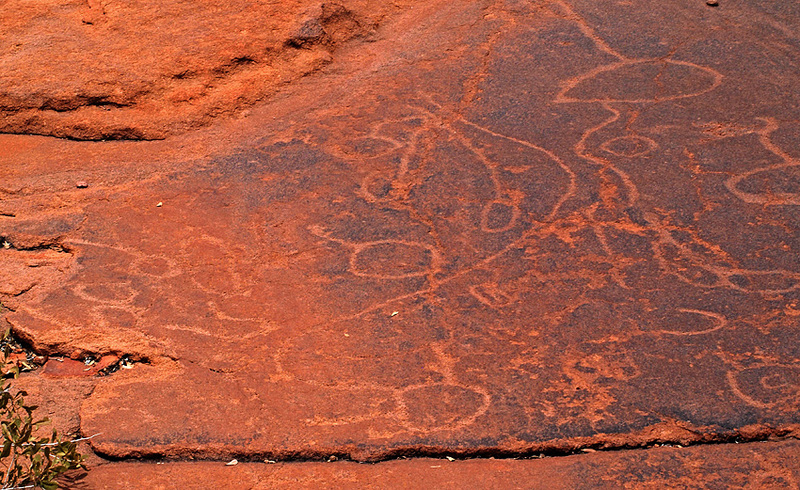 In this area are at least 2,500 and perhaps even 5,000 items of rock carvings can be found and also a few rock paintings. 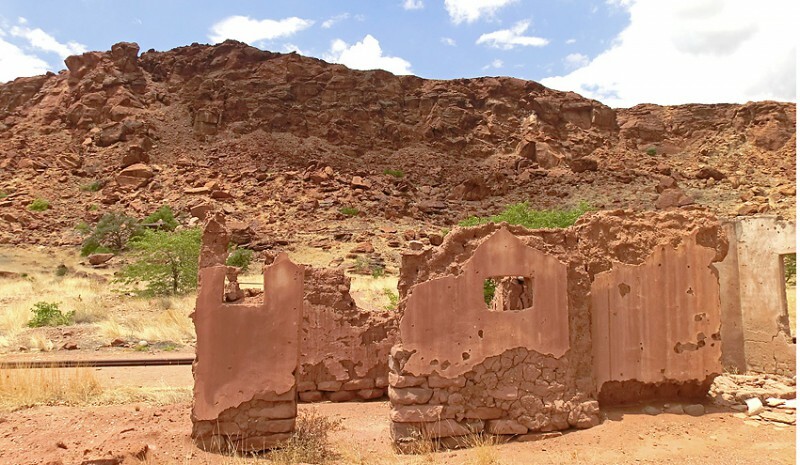 After the Khoi-khoi the Damara people came to the area. They lived a nomadic life and had sheep, goats and cattle. They also started making pottery and worked with metal, especially copper. Some of the engravings show cattle from this later period. In later years people stayed away from this place. It was thought to be powerful, perhaps even dangerous. As part of apartheid this area was in 1971 allocated to be exclusive for Damara farmers – Damaraland. In 1999 a conservancy was registered. It has today got a population of just over 200 Damara-speaking people. 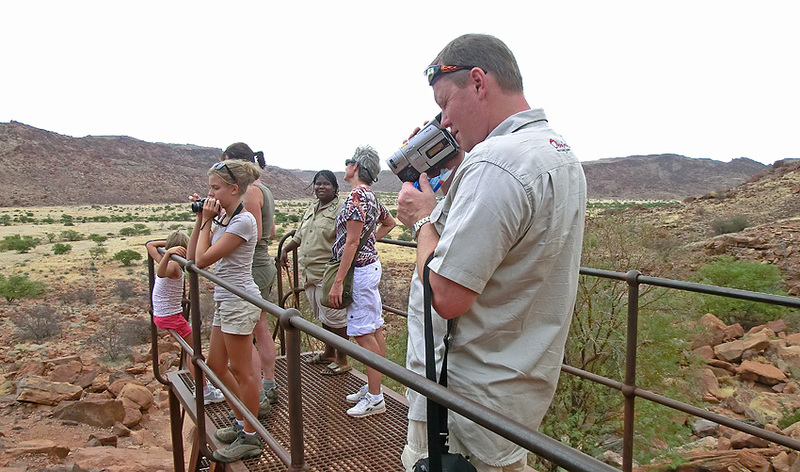 About 17 of these work as guides at Twyfelfontein, others work with the “Living museum” or with the camp. This place is definitely one to visit!